Germany’s Bauhaus art school emerged in 1919. While it only existed for 14 years, it became one of the most influential modernist art schools of the century. Scholars of Bauhaus, which translates literally to ‘architecture house’, were guided by the idea of democratic design for all; the fundamental premise was to create a link between art and craftsmanship. The influence of the Bauhaus movement has been far-reaching. Not only did it pave the way for avant-garde art and modern architecture, but its style is recognised around the world, explained a spokesperson from visitBerlin. Germany will celebrate 100 years of the transformational school of thought in 2019. Travellers in Berlin can go beyond the numerous exhibitions, events and workshops with a stay at the carefully preserved Ellington Hotel Berlin, which contains striking elements of the Bauhaus architectural style – particularly the New Objectivity movement, which was a realist reaction against Expressionism. The Ellington Hotel, which lies behind one of the most impressive Bauhaus facades in Berlin, has preserved the charm of the late 1920s and early 1930s in its entrance rooms, staircases and halls. Although it was remodelled in 2007, the hotel has retained many features of Germany’s Golden 20s to give guests a sense of the building’s noteworthy past. While the hotel’s 285 rooms have been redesigned in a minimalist style, eye-catching elements of New Objectivity’s emphasis of pure architectural features are apparent even before entering the hotel. The travertine-clad facade, with its oriel windows and strong horizontal lines, is a tribute to the modernism of Bauhaus and New Objectivity. The building’s original entry hall is lined with cream and green ceramic tiles. The striking brass frames of the large glass entrance door, high windows and solid stone staircase, with an extravagantly shaped ceramic handrail, are all reminiscent of New Objectivity. Throughout the restoration of the Ellington Hotel, there was a strong focus on keeping the magic of the building’s vibrant past alive. Some of the most famous nightclubs in Berlin were once held in the Ellington Hotel’s building on Nürnberger Strasse. 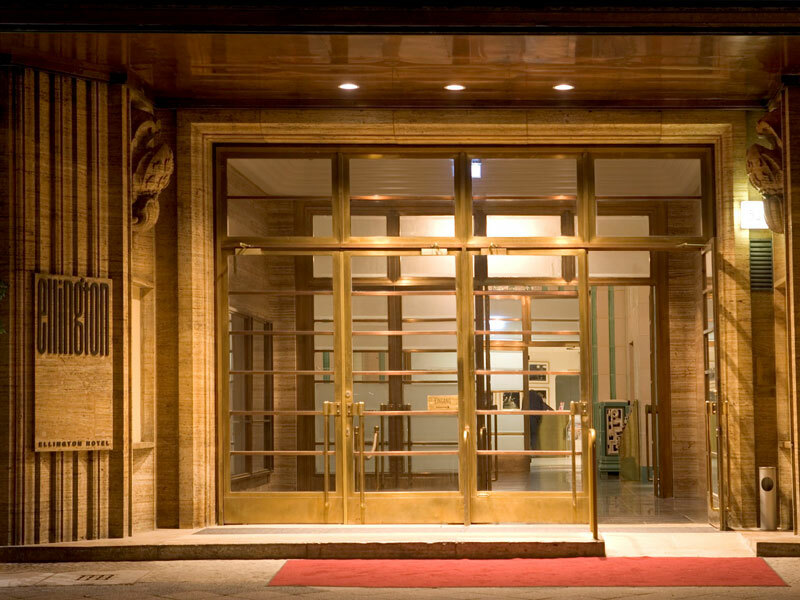 It was here that Louis Armstrong, Ella Fitzgerald and Duke Ellington performed in the legendary nightclub Badewanne. Frank Zappa, Carlos Santana, Iggy Pop and Barbra Streisand, among countless others, also danced the night away in the legendary nightclub Dschungel. Today, the Ellington Hotel continues to uphold the legacy of its location with its core brand and marketing strategy. Each room of the hotel displays unique works from Susanne Shapowalov, a jazz photographer whose work offers an intimate, behind-the-scenes look at the most famous jazz artists of the era. The number of business travellers in Berlin grows each year, and the Ellington Hotel’s premier location makes it an attractive option for a jam-packed business trip. Its proximity to Berlin’s legendary Kurfürstendamm shopping boulevard means the Ellington Hotel is convenient for any meeting in the surrounding business districts. Furthermore, the Ellington Hotel’s DUKE Bar and Lounge, with its business lunch menu, is a great venue for meetings, which is why many business travellers choose to host their meetings in-house. For larger events, the Ellington Hotel offers 10 unique conference rooms that provide space for up to 800 people. The hotel has three unique executive suites that offer space to work and host business meetings, in addition to all the usual amenities. Members of the hotel’s business partner programme benefit from personalised booking assistance, best price guarantees, cancellation flexibility and much more. With a dazzling history and plenty of business perks, the Ellington Hotel is sure to impress.